MCU microprocessor. The internal circuit uses SPXO as the basic standard to guarantee the stability of signals. Surface mounting technology improves interference immunity and operational life span. Sine, Square, Triangle(Ramp), Rise Sawtooth, Fall Sawtooth, Lorenz Pulse, Multitone, Noise, Cardiogram, Trapezoidal Pulse, Sinc Pulse, Narrow Pulse, Gauss White Noise, AM, FM, Step and user-defined waveform. It can also output TTL electric level. Both channels are completely independent. It has friendly human-machine mutual interface. 2.4 inch TFT Color LCD with 320×240 resolution can display all the parameters of both channels and current functions of all buttons . Shortcut keys simplify all complicated operations and save time. Users can be proficient after several minutes practice. 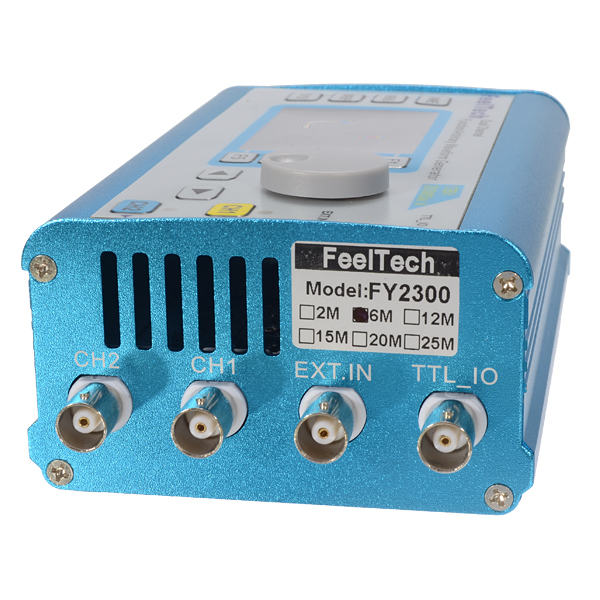 The advantages of this instrument in signal generating, waveform sweeping, parameter measurement and other fields, make it to be the ideal equipment for electronic engineers, laboratories, industry producing line, university, R&D institutes and so on. 1 High frequency precision up to 10-6 orders of magnitude. 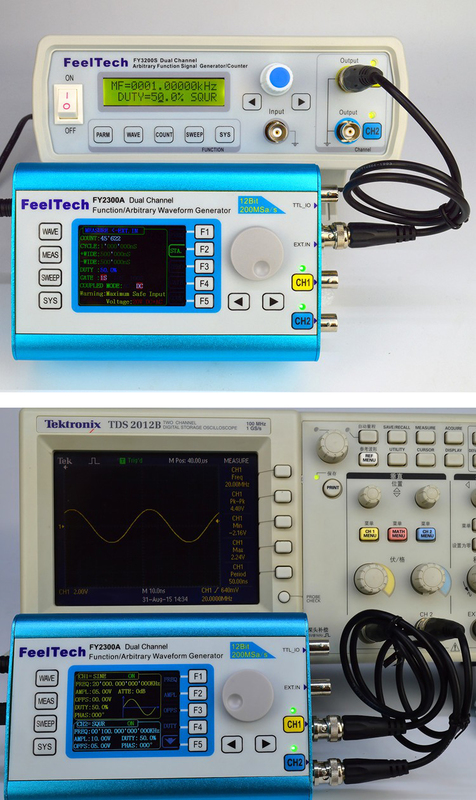 2 Full range of 1μHz frequency resolution. 3 Minimum amplitude resolution can be up to 1 mV. 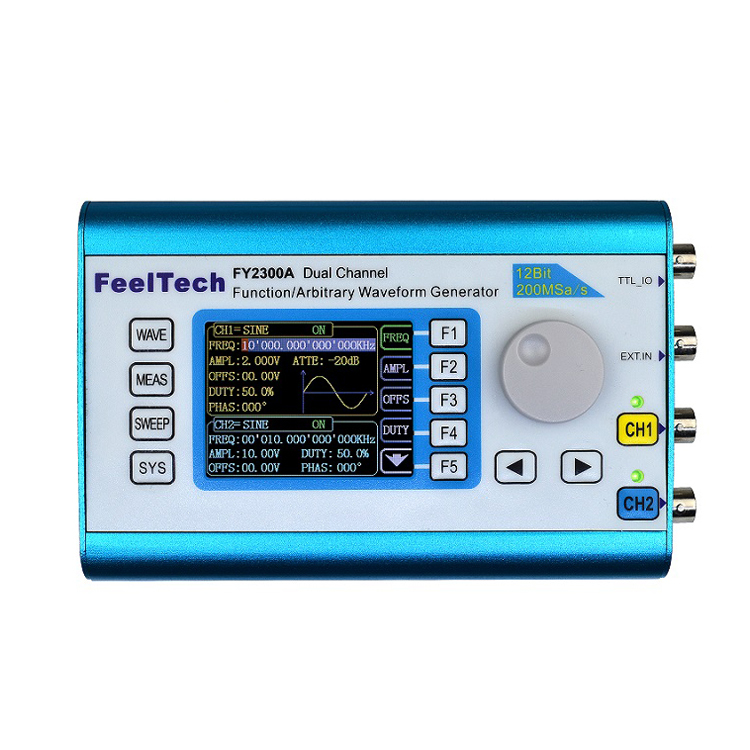 4 Duty cycle of each channel can be adjusted separately. Precision can be 0.1%. 5 Direct digital Setting covering full range of frequency without grading. 6 Sweep Function: It can sweep 4 properties of signals including frequency, amplitude, offset and duty cycle. It has Linear and Logarithm two sweep types. Sweep time can be up to 999.99S. Sweep starting point and end point can be set arbitrarily. 7 It has pulse train burst output function. There has Manual Trigger, internal CH2 Trigger, and External Trigger for your options. It can output 1~1048575 pulse trains. 8 -10V~+10V DC Offset function. Resolution 0.01V. 9 Digital signal output function can output any 0~10V CMOS electric level. 10 Save function: It can save 20 sets user-set parameters and can be loaded at anytime. 11 It can measure frequency, period, pulse width and duty cycle. Max. frequency workable is 100MHz and Min. frequency workable is 0.01 Hz. 12 Counter Function: It has 2 coupling measure modes including DC coupling and AC coupling. This design can solve inaccuracy problem of AC coupling. 13 All parameters can be calibrated by internal program. 14 Powerful arbitrary waveform edit function: Users can download arbitrary waveform to this instrument after edit through PC program which is included in user CD. 15 Powerful communicating function. All functions can be controlled by PC program and the communication protocol is open for secondary development. 16 Output short-circuit protection: All channels can work more than 60 seconds when the load is short-circuited. 17 Can choose our FYV2000 series or FPA1000 series power amplifier to output 20W~60W signal in DC-3MHz width without any distortion.